I truly love Rescue Beauty Lounge. Every nail polish in the line is gorgeous, applies beautifully and is like no other color out there. And both Insouciant and Aqua Lily are, of course, no different. Both of these nail polishes had been sold out for awhile, and just came back recently in the BIB4 collection. BIB stands for Bring It Back, which the line's founder, Ji Baek, does every once in awhile for the true favorites. And thank goodness these two made the cut this time around, because I had missed out on buying them when they were originally available! Insouciant is a dusty lilac with grey undertones. But what really makes it stand out is the blue shimmer -- it just makes this polish so much different than any other lilac I've come across. It applies like a dream in two coats and lasts for days without chipping (while writing this, it's been four days and not one chip!). This is definitely one of my favorite Rescue Beauty colors ever. 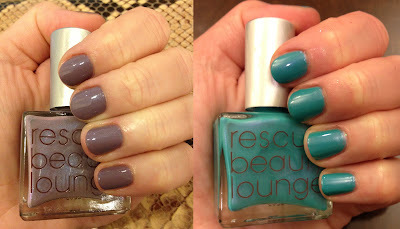 Insouciant retails for $20 at rescuebeauty.com. Aqua Lily is, as you might expect, aqua. Ji was inspired by the water in the Maldives, and the fact that the waves were reflected with pink shimmer. And that's exactly what you find in this stunner! I loved it so much when I put it on my fingernails that I immediately ran out and got a pedicure with it. It's a must-have for anyone who likes green and blue polish. Unfortunately, Aqua Lily has sold out, but who knows -- maybe it will come back someday!